Denise DiBella started her small business seven and a half years ago to widen the variety of affordable programs available to Long Island families. Denise DiBella started her small business seven and a half years ago to widen the variety of affordable programs available to Long Island families. Today at her Sayville-based play center, DiBella is also giving children who suffer from serious illnesses a reason to smile. A Long Island mom of three youngsters, DiBella decided to carve out a new career after taking her oldest child to a mommy and me program. She felt like she could use her background in childcare and coordinating children’s activities to create programs of her own. When a retail space became available, DiBella jumped on the opportunity and opened Little Sunshine Playcenter, which hosts classes, workshops, programs and children’s parties. Feeling fortunate that she was able to operate her own business and seeking a way to give back to the community, DiBella’s opportunity to help others surfaced in 2004. A mother who came to Little Sunshine to book a birthday party for her child noted that the celebration might have to be cancelled at the last minute because her 2 year old had leukemia. The child might need a treatment or might not be feeling well that particular day. According to DiBella, the chance to give back had come knocking, and she quickly formulated a plan to carry out the party for this mom and child completely free of charge. Caring for a sick child may be “hard on the family financially,” DiBella says, as insurance doesn’t always cover expenses. A complimentary party reduces financial obligations while making the parents as well as the birthday child happy. It’s a welcome relief in a life full of doctor’s appointments and treatments. “If you can do something, you should,” DiBella says. And so, she did. The first donated birthday bash featured all of the usual Little Sunshine accoutrements, including the child’s chosen theme, music, crafts, games, decorations, food and beverages. The parents were extremely thankful. The event’s success propelled DiBella to reach out to people who work with young cancer patients to find other potential free party candidates. Little Sunshine now provides about five to six of these parties a year, and DiBella hopes to organize even more complimentary birthdays in the future. “I’d like to reach as many people as I can,” she says. DiBella is also looking to partner with venues that host parties for older kids, as Little Sunshine caters to the younger set. The free parties currently feature donated pies from Oakdale’s Pizza Network, enabling another community hot spot to contribute to a good cause. Before all birthdays commence, Little Sunshine staff ensures the already clean and cheerful facility is thoroughly sprayed with disinfectant to make it most comfortable for children with compromised immune systems. Children attending parties are given hand sanitizer before the fun begins, and the birthday child is allowed as many guests as desired. For additional details about Little Sunshine Playcenter, 299 Raft Ave., Sayville, dial (631)563-PLAY. Ask to speak with Denise DiBella if you know of a child with an illness who may qualify for a free party. 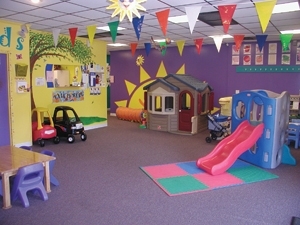 For information on classes, programs, workshops and parties at the facility, visit www.littlesunshineplaycenter.com.